The ‘triple lock’ introduced by George Osbourne and the coalition Government in 2012 means the State pension rises each year by the highest of price inflation, average earnings growth or 2.5%. The Governments own Actuary’s Department estimates the triple lock is adding £6bn a year to the State pension bill. A report published last week concluded that the State Pension Age may need to increase to age 70 by 2060 to fund the increasing costs associated with longevity. In certain postcodes, average life expectancy remains below age 70 which is quite a shocking statistic in itself. 2060 sounds a long way off, but that’s around when today’s GCSE and college students will reach age 60. The report highlighted that between 2010 and 2016 the State Pension increased by 22.2% compared to earnings growth of 7.6% and price inflation of 12.3%. It doesn’t come as a surprise to me that the predicted State Pension bill in a few decades is out of control because the same can be said of long term care costs and the NHS to mention just two. 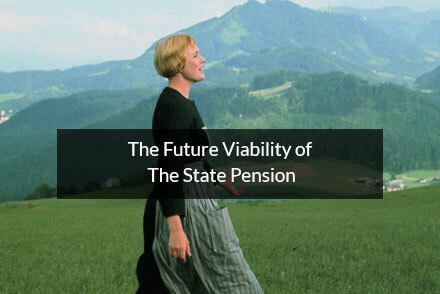 How do you solve a problem like Maria the State pension? However unpalatable it would be politically, it seems logical to me that means testing is a solution; Richard Branson doesn’t need a State Pension to maintain his lifestyle. I’m sure he’s paid his fair share of taxes over the years and is therefore entitled to it like everyone else, but as I say, he doesn’t need it. There is a level of wealth above which you could argue not to pay the pension and for what it’s worth that’s my solution. We need to ensure those in need get the financial support required but to pay for that, those who are not in need may have to give something away. The Government have said they will review the State Pension ahead of the next Parliament in 2020, although I think they will be busy doing other things as well so whether they will get round to it is hard to tell.